On arrival in Great Yarmouth proceed over the Fullers Hill roundabout towards the town centre, taking a left turn at the traffic lights onto Northgate Street. Proceed the full length of Northgate Street, straight ahead at the two mini roubndabouts. 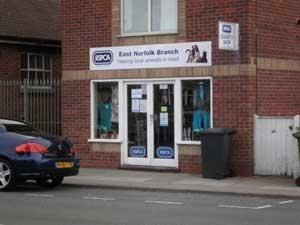 The RSPCA shop is located on the left hand side a short distance after the second mini roundabout near the junction with Salisbury Road.